In an upset, the Clemson Tigers scored the winning touchdown with one second left in the game to beat the favored Alabama Crimson Tide, 35-31. The first half was all Alabama. They were up early 14-0. And led at the half 14-7. The commentators frequently discussed how the Clemson quarterback, Deshaun Watson, seemed “raddled” and “out of sorts.” No wonder. 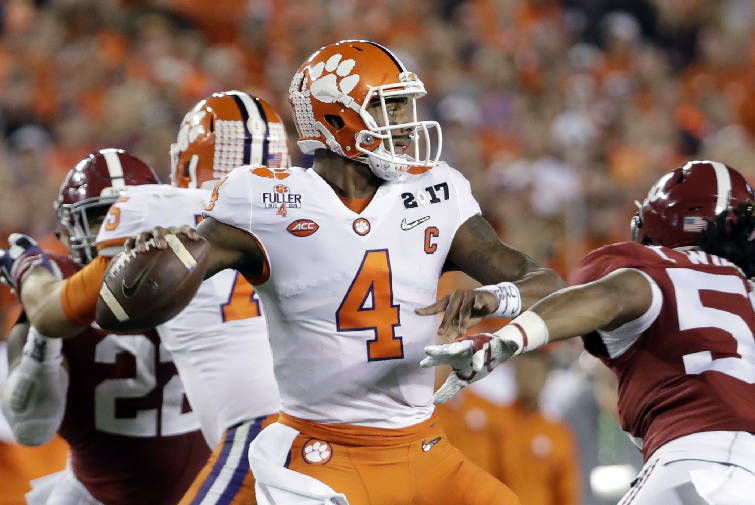 Watson was pounded all night long by a bruising Alabama defense. It felt like Alabama was in control. In fact, several times I almost went to bed thinking the Tide was just too tough and too good to lose this game. But the Tigers wouldn’t give up. After trailing by 24-14 at the end of the third quarter, Clemson took over and scored 3 touchdowns in the fourth to win. But not without a ‘Bama fight. When the Tigers took the lead for the first time, 28-24, Jalen Hurts and the Tide promptly marched down the field and regained the lead. But the Tigers wouldn’t quit. With only 2 minutes to go they drove 68 yards in 9 plays to score and win the game in the final second. Now, it you’re not a sports fan, or don’t like football, this may be a bit boring to you. But it was a great lesson in persistence. Perseverance. Fortitude. And a dogged determination that will not quit. It’s a quality that Christians need in the our battle against the devil. We’re in the fight of our lives. “For we do not wrestle against flesh and blood, but against principalities, against powers, against the rulers of the darkness of this age, against spiritual hosts of wickedness in the heavenly places” (Eph 6:12). We are combating worldliness. Carnality. Immorality. Spiritual indifference. False religion. Antagonism against Christianity. And “fleshly lusts that war against the soul” (1 Pet 2:11). Sometimes it feels like we’re losing. That it’s the fourth quarter and we’re pushed back deep against our own goal line. That the clock is running out. And it’s 3rd and 16. What can we do? When temptation seems strong and the evil appears to have the upper hand, don’t give up. When you feel beaten and bruised by the enemy’s constant assaults on your soul, don’t give up. When discouragement and despair hovers over you like a thick morning fog, don’t give up. When your friends turn against you and your family is not there to support you, don’t give up. When brethren let you down and no one seems to care, don’t give up. When your husband is unfaithful, or your wife just walks away, don’t give up. When you’ve failed. Again. And guilt is eating away at your conscience.. Don’t give up. Instead of giving up, “Watch, stand fast in the faith, be brave, be strong” (1 Cor 16:13). Instead of giving up, “be steadfast, immovable, always abounding in the work of the Lord, knowing that your labor is not in vain in the Lord” (1Cor. 15:58). There’s still 1 second left in the game. Don’t give in. Don’t give out. Don’t give up.